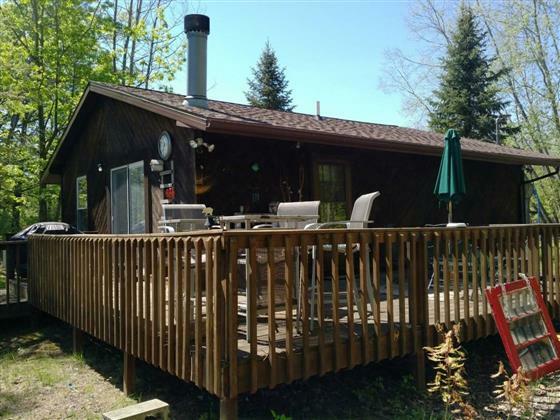 You'll love the nice lake cottage located in a quiet location on a dead end road. The nice cottage sits on over 3/4 of an acre with over 123 ft of water-frontage with a steel seawall. Sit out on the expansive deck overlooking Smallwood Lake and enjoy gorgeous panoramic views. Walk down the wide steps to the screened in gazebo located more than halfway down to the dock. Jump into your boat and go for a leisure ride on the lake or some all-sports fun! Relax inside the cottage after a long day of play on the lake. You'll love the open floor plan between the kitchen, dining area, and living room. There is even a breakfast area to line up your bars stools at the counter. Look out the door-wall facing the lake to enjoy the view from inside. You'll love the pole barn which is currently set up for entertaining! This cottage offers a private setting and lots of space. Maike your appointment today!